WASHINGTON CITY – A longtime goal of city officials to see commercial development rise along Washington Parkway continues to bear fruit with the unveiling of a major project earlier this month. 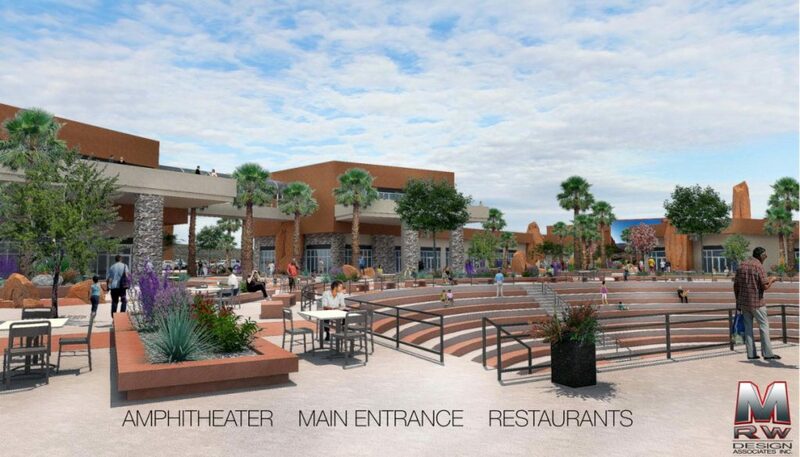 “Grapevine Crossing,” an 80-acre project set on the east side the Interstate 15’s Exit 13 leading onto Washington Parkway, is described as a resort-commercial style project that takes an “experience-based approach” to retail. Troy Belliston, Washington City Councilman and the developer-owner of the project, said the concept of the development is to combine public facilities like a park or amphitheater with retail outlets and restaurants so the two can share the same patrons in a mutually beneficial relationship. 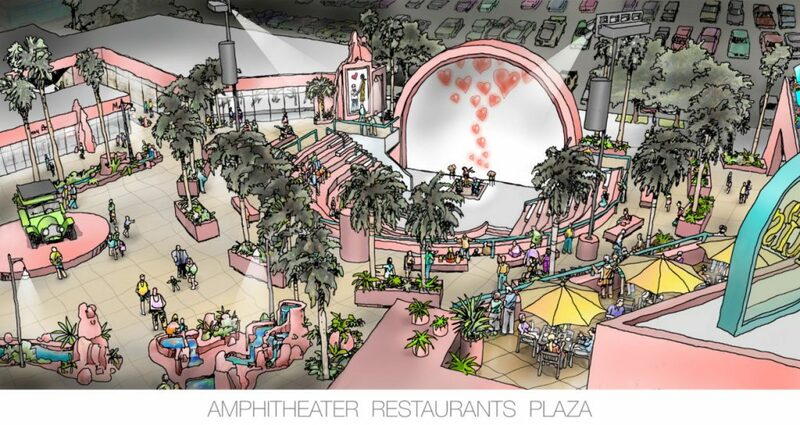 “If we take the concept of an amphitheater and combine it with some restaurants, then that public utility boost that private entity and vice-versa,” he said. For example, a family who may be waiting on a table at a restaurant may wait by the amphitheater and enjoy an outdoor program, Belliston said. Beyond the idea of parks and an amphitheater, there are plans to incorporate special attractions and exhibits into the development. 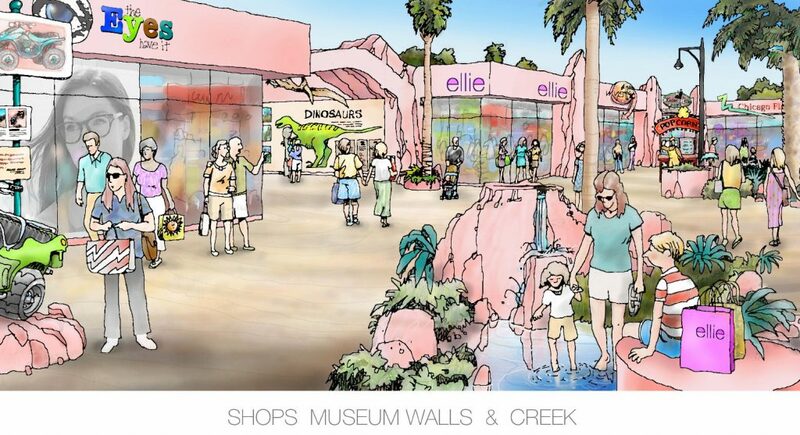 That would include exhibits related to the desert tortoise and dinosaurs, among other attractions. “We’ve tried to incorporate perceptions of what makes Southern Utah special,” Belliston said. It was be the amphitheater and parks that would add the “public” aspect to the development. Developers plan to approach the city with a request for tax-increment financing which would defer property taxes above a certain rate to go back into the project. This would be used to pay for the parks and amphitheater, which would be gifted to the city in return, Belliston said. The overall project will cost an estimated $150 million with plans for 137 tenet spaces. The project also sports spots for a grocery store and theater, as well as spaces for seven restaurants and seven drive-thru establishments. The project is near the end of the design phase with Belliston about ready to start marketing it, he said. The general concept and conceptual designs were shared with the Washington City Council Jan. 9, with a wider debut given during the St. George Area Economic Development Summit Jan. 11. “I think it’s a wonderful concept,” Washington City Mayor Ken Neilson said. The area around Exit 13, he said, has long been eyed by commercial developers as a potential hot spot. Already home to a Maverik convenience store and gas station, other incoming businesses to the area off Exit 13 include a Black Bear Diner and a Best Western hotel. The development would also help add to the sales tax revenue the city is able to collect for its annual budget. That is another reason why the Neilson and other elected city officials are pleased with the incoming development along Washington Parkway. Being a member of the City Council, Belliston acknowledged a conflict of interest he said he’s been very open about with others. When it comes to voting on anything related to Grapevine Crossing, however, Belliston said he will recuse himself accordingly. The development is anticipated to take five to seven years to build once construction starts, with ground possibly being broken within the year if all goes well, Belliston said. I think our officials are trying to turn St George into another Los Angeles. Sounds like a good idea until all the crime comes in and the traffic. This place is already too big and too much crime. Growth is here to stay. Love it, hate it, or be neutral, it’s going to continue. Personally, I get a big kick out of the folks who have moved here from some place else, then wish to stop development. I’m frankly excited about this development, and hope it moves along, quickly. Part of my feelings here are purely selfish. I live in the older section of Hurricane. I just hate the fact that to get a decent meal, I have to drive all the way into St. George. I hate that the only restaurants we have here that are decent, are fast food joints! I’m sick of our local grocery store that time and again, tries to peddle stuff that is either very near to the code date, or well expired. Right at the moment, I’m talking about Pillsbury Bread Sticks that have been “on sale.” And when this has been called to the attention of management, they have done nothing about it, other than give me a dirty look and then walk away from me. The down hill journey of both the restaurants and grocery store has rapidly increased over the last five years or so. My sakes alive. You have really come face to face with an imminent disaster of mega proportions. imagine that, Pilsbury bread sticks have caused you major heart burn, and a little twitch of pain in the old hemorroids, to boot. My advice, keep on truckin’ til you find that residential nirvana in your mind. Troy Belliston is obviously another example of the “Good Old Boy System” that is so prominent here in Washington County. In other communities this would not allowed. But this conflicted government has been going on for so long that it is considered the norm. All this growth will certainly bring with it a lot of problems. Goodbye Peaceful Dixie, Hello California chaotic sprawl all over again. Not pretty folks! You are being marketed (sold out)! Not a huge fan of all the growth myself…….but you made a blanket statement about this not being allowed in other communities. Just wondering what communities those are. The ones that don’t allow any commercial development at all. The few I am aware of, and one that I lived in, have become nightmares from the standpoint of affordability. Very mundane homes cost well over a million dollars. And by the way, the truly wealthy are still able to grease palms and do whatever they want in those communities as well. Why wouldn’t this be allowed in other communities? Is it because he is on the City Council and also the developer? The Citizens of Washington city elected him to that position, probably because of his knowledge of planning and managing development. So your only real outrage should be if he, as a city councilman, were able to get special favors because of his position that would allow this project when some other developer, not on the city council, wouldn’t have been able to get approval for this project. Personally I love the Vision of this project and I can’t wait to see it completed. Nice, another development, more people, traffic. The greed never stops here. Yes, and I moved here from So. CA 25 years ago to escape the rat race. I personally like it, and I live off Exit 13, so the traffic will “affect” me. One reason I love this area is the constant development. I bought a townhouse in Bluffview Townhomes, looked around at all the empty space and wondered what exciting plans the future holds. I’m ridiculously giddy about the Black Bear Diner being built right now. And since I eat out more than I cook, I like the idea of all the restaurants being so close for more variety. *chants* Persian food, Persian food… I need a good chicken koobideh nearby. Totally Agree with you. I’m excited to see this project happen. I like the project too, but “Grapevine Crossing” is a really dumb name. Wish they would call it something else. Once again I ask…..where is the water coming from to sustain all of this development? Maggie I will answer your question about the water. Since we are ordinary citizens without a ton of wealth, we are constantly reminded about the importance of conserving water. We read the articles in the newspaper about how the Lake Powell pipeline will become necessary to supply us with water. We are indoctrinated about our duty to save water. Now, here is where things get interesting. If people or corporations with large sums of money dangle cash before the eyes of the city, they will let them waste as much water as they want. They will get the needed permits, they will justify the extra usage of water via any means possible, and everyone looks the other way. It can be splash pads, fake rivers, giant fountains, whatever. If you have been a homeowner for a length of time, you know what comes next. You get that special notice with your January utility bill every other year about how your rates will increase, and an official statement about the reasoning behind it (funding for extra capacity, pipelines, replace 100 year old corroded mains, allowance for expenditures, you name it!). Then because we have no say in the matter, we will all bend over and take it. Why? Because it’s not like you can switch to another water company, or argue about the rate increase (with any meaningful results anyways). So to answer your question, the water ultimately comes out of our wallets! Build it and they will come. Rent isn’t high enough yet? This is how the rich weed out the poor. This town will soon collapse from all the top weight.